Want to show someone what an app looks like on your Apple Watch. You can take screenshots on the watch by pressing down the digital crown and side button on the watch simultaneously. Screenshot images will be saved to the camera roll on your iPhone whee you can access them later on. When you’re done using your Watch, you can get the screen to power off by putting your hand over it for a few seconds. Hold you hand over the display until you feel the watch buzz to quickly put it into silent mode while you’re in a meeting or movie. If you’ve misplaced your iPhone, you can use your Apple Watch to track it down. Just swipe up on your Apple Watch display and then swipe to the control panel screen (the first one in the group) from there, tap on the iPhone icon to have your phone make a dinging noise. This feature still requires you to be in Bluetooth range of your phone, so it’s not going to do you any good if you left your phone at the bar down the street, but it can make it easy to pinpoint where your iPhone is in your living room and if it found its way under your sofa. If you need to return to the last app you were using, you don’t have to go through the Apple Watch’s menu to get there. Double pressing the digital crown will launch the last app you were in instantly. You’re not stuck with the default text messages that came on the Apple Watch. You can customize the built-in messages by going into the Apple Watch app on your iPhone, selecting Messages, and then “Default Replies.” From there you’ll be able to see all of the replies that are currently loaded onto your iPhone and swap out any you don’t like with something new. 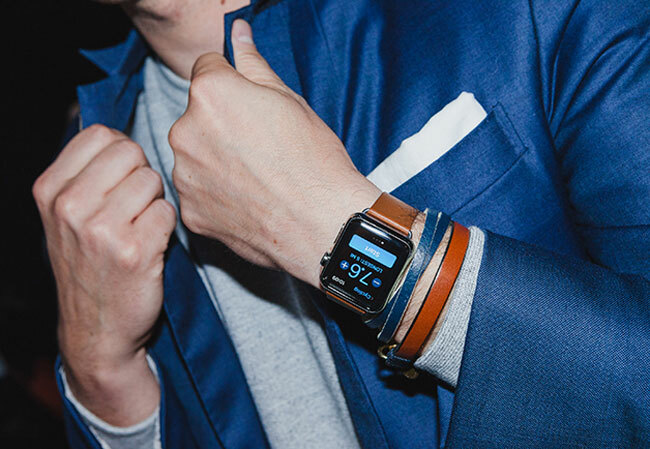 Tired of clearing notifications on your Watch one at a time? You can clear all of the notifications you have on the device at once by pressing and holding on the notifications screen. A button will appear asking if you want to clear all of the pending notifications. Tap that button, and they’ll all disappear. You don’t have to use a button in order to launch Siri. The digital assistant will also respond to you if you simply say “Hey Siri!” while the Watch face is activated. Sharing your location is very simple on the Apple Watch through the Messages app. if you’re texting with someone on the Watch, press and hold on the screen to get a “Send Location” button. Tap that button to instantly send the person you’re chatting with a pin with your current coordinates.